The SLR Magic 8mm F4 is a compact and lightweight ultra-wide angle lens for the Micro Four Thirds system. The lens was released in march 2017 and although it costs only 350$ it is built out of metal. The SLR Magic 8mm F4 was designed to be used with camera drones. However, in this review, I am going to check if it is also a good option for “normal” cameras. Mein Testbericht des Olympus M.ZUIKO DIGITAL ED 25mm 1:1.2 PRO, dem ersten Objektiv aus Olympus neuer F/1.2 Pro Reihe. Ich habe das Olympus 25mm 1:1.2 hinsichtlich Schärfe, Flares, Bokeh und Chromatischen Aberrationen untersucht. My review of the Olympus M.ZUIKO DIGITAL ED 25mm 1:1.2 PRO, the first lens in Olympus new F/1.2 Pro lineup. I tested the Olympus 25mm 1:1.2 regarding sharpness, flares, bokeh, and CAs. A sharpness comparison between the Olympus M.Zuiko 25mm F/1.2 Pro and the Olympus M.Zuiko 12-40mm F/2.8 Pro. The Olympus 25mm F/1.2 is the first lens of Olympus new series of F/1.2 primes. Design and features are similar to other Olympus Pro lenses. There is a good chance, that someone who is interested in the Olympus M.Zuiko 25mm F/1.2 Pro already owns the Olympus M.Zuiko 12-40mm F/2.8 Pro. Therefore, I am going to compare the two lenses in this article. Usually prime lenses are sharper than zooms, however, the Olympus 12-40mm F/2.8 is already a very sharp lens. Will the Olympus M.Zuiko 25mm F/1.2 Pro be able to surpass it or is it “just” 2,5 stops faster? Ein Schärfevergleich zwischen dem Olympus M.Zuiko 25mm F/1.2 Pro und dem Olympus M.Zuiko 12-40mm F/2.8 Pro. Das Olympus 25mm F/1.2 Pro ist die erste Festbrennweite aus Olympus neuer Reihe von professionellen F/1.2 Objektiven. Es orientiert sich dabei in Design und Funktion an den bisherigen Pro Objektiven. Es besteht eine gute Chance, dass, wer sich für das Olympus M.Zuiko 25mm F/1.2 Pro interessiert, bereits Olympus professionelles Standardzoom, das Olympus M.Zuiko 12-40mm F/2.8 Pro besitzt. Das Olympus 25mm F/1.2 Pro ist 2,5 Blendenstufen lichtstärker, dies allein ist ein guter Kaufgrund. Doch wie sieht es mit der Schärfeleistung aus? In der Regel sind Festbrennweiten hier besser als Zoomobjektive. Das Olympus 12-40mm F/2.8 Pro ist allerdings bereits sehr scharf, sodass es schwer wird. es zu übertreffen. The ZY Optics Mitakon Speedmaster 25mm f0.95 is a normal focal length lens for the Micro Four Thirds system released in fall 2015. It is a purely manual lens from China. 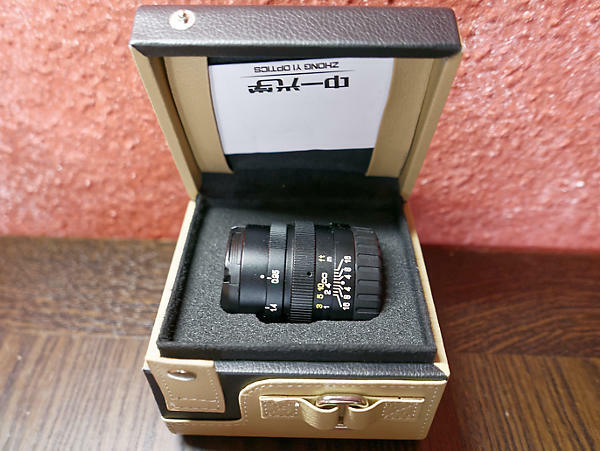 The Mitakon 25mm 0.95 is the third manual F/0.95 lens for the MFT-system. The other lenses are made by Cosina Voigtländer and SLR Magic. The Mitakon 25mm is a lot cheaper, smaller and lighter than the competition. It has a RRR of 400 $, while the Voigtländer and the SLR Magic have a RRR of 800$. The Mitakon is only 60mm x 5mm (diameter x lenth) and weights 230g. Both the Voigtländer (58mm x 70mm, 410g) and the SLR Magic (65mm x 85mm, 490g) are bigger and heavier. Did ZY Optics release a little marvel or did they have to reduce the image quality to achieve this size and price? The Mitakon 25mm is shipped in a very high quality box. Both lens caps are included, but there are no other accessories, not even a lens hood. ZY Optics Mitakon Speedmaster 25mm f0.95 box. The build quality of the ZY Optics Mitakon Speedmaster 25mm f0.95 is very high. It is made of metal and the focus ring as well as the aperture ring are well damped and move smoothly. The new Panasonic Lumix G 25mm F1.7 is a fast standard lens for the Micro Four Thirds system with a very low price. Is this lens a great bargain or just a cheap lens with too many compromises? This article compares the sharpness of the Olympus M.Zuiko 25mm 1:1.8 and the Panasonic Lumix G 1.7/20mm. I am currently working on a full comparison review. All pictures were taken with an Olympus OM-D E-M10. I used a tripod, the 0 sek. anti-shock setting, a remote release and turned the stabilization off. I also took several pictures for the image center and the image border for every aperture and selected the sharpest to make sure that the result was not affected by focusing errors or other external factors (f.e. vibrations).